It’s not every day that we hit a milestone as a company and community, but we thought we would stop to take a short break to celebrate hitting £300 million lent since we started. Yes you heard us correctly, £300,000,000. This is a huge figure, and we are the first peer-to-peer lender in Europe to reach it. We could not have done this without the continuing support from both our savers and borrowers, who trust us to match-up and reward responsible people who are good with their money. We have over 40k savers who have lent collectively £300 million to help people buy new cars, upgrade their homes, propose to their loved ones and get married, buy boats and even re-train with educational courses. We are always looking at new ways to provide a better service and this is why we have recently introduced the Zopa Safeguard offer to help reward people who are good with money. We have introduced the Safeguard after taking feedback from our customers in order to provide a safer way grow your savings by lending. 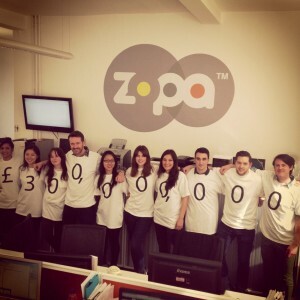 Here you can see some of the Zopa team celebrating the big THREE-O-O, but to give something back to you, we are giving away three £100 Amazon gift vouchers for the best images around what 300 means to you. Post them on our Facebook page and we will look to draw three winners in the coming week from the best submissions. Thank you again for continuing to grow your savings and borrow with Zopa and here’s looking forward to half a billion pounds in the very near future!